Molecule-r Cookbook Deluxe Edition The Molecule-r Gastronomy Recipe Book Deluxe is special because it is both a modernist recipe book and molecular gastronomy kit combined. This makes it more than just a beautiful coffee table book (which it is) because you can jump stright into the kitchen to try out your recipes as soon as you've read about them! molecular gastronomy recipe bookThe molecular gastronomy recipe book comes with nine molecular gastronomy ingredients, 70g of each. They all have long shelf-lives so don't think you need to rush through all of the recipes before your chemical powders all expire. Here is a list of the ingredients and a brief summary of there usage and back-story. For the health conscious and animal lovers it is worth noting that all of the gastronomy chemicals are vegetarian. Although there is not much mention of it in the book, many of the ingredients can also be used with cream chargers and nitrous whipping equipment – look around the Cheeky Monkey site for recipe ideas. 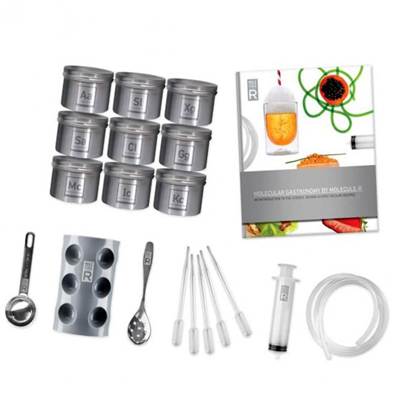 You could also consider purchasing the molecule-r syphon kit which or onw of our starter packs as an addition to the molecular gastronomy recipe book. 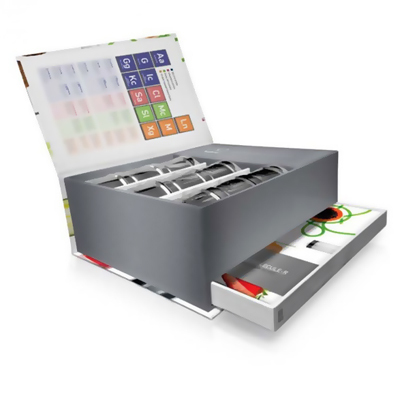 The Molecule-r Gastronomy Recipe Book Deluxe is special because it is both a modernist recipe book and molecular gastronomy kit combined. This makes it more than just a beautiful coffee table book (which it is) because you can jump stright into the kitchen to try out your recipes as soon as you've read about them! 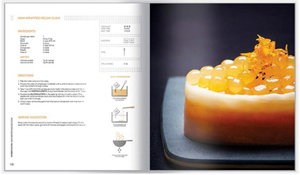 The molecular gastronomy recipe book comes with nine molecular gastronomy ingredients, 70g of each. They all have long shelf-lives so don't think you need to rush through all of the recipes before your chemical powders all expire. Here is a list of the ingredients and a brief summary of there usage and back-story. For the health conscious and animal lovers it is worth noting that all of the gastronomy chemicals are vegetarian. Although there is not much mention of it in the book, many of the ingredients can also be used with cream chargers and nitrous whipping equipment – look around the Cheeky Monkey site for recipe ideas. 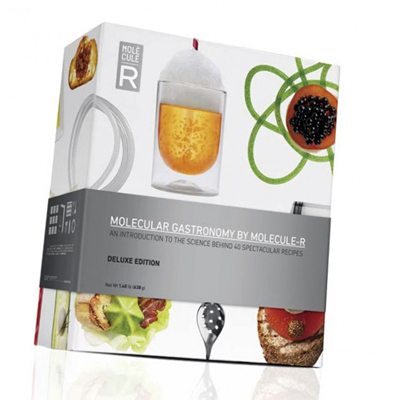 You could also consider purchasing the molecule-r syphon kit which or onw of our starter packs as an addition to the molecular gastronomy recipe book. Calcium lactate is used in molecular gastronomy as a flavourless source of soluble calcium ions. These are needed for setting recipes that include its partner in crime Sodium Alginate. The two of these together perform the magical spherification recipes (standard, reverse and frozen reverse) that are always the best intro to the world of modernist cuisine. When not being used as a toy in the kitchen, Calcium Lactate finds use as a medicine (it's an easily digestible, soluble source of calcium ions) and can also be included in toothpaste or chewing gum because when in contact with teeth then it can help to rebuild superficial layers of enamel. As a molecular gastronomy ingredient it is never really needed without the Sodium Alginate. Some recipes that call for the use of Calcium Chloride can be replicated with the less foul tasting Lactate. More about Calcium Lactate. Carrageenan is another molecular gastronomy ingredient that starts life as constituent part of seaweed. And like other of the seaweedy chemiclas it is a gelling agent and thickener. The molecule-r gastronomy cookbook (deluxe) contains the Kappa and Iota forms, but there is a third type Lambda that is special because it doesn't form a solid gel but only thickens. As to the difference between iota and kappa carrageenan they both do the same thing but in different environments Iota is set by calcium ions (just like sodium alginate) whereas the Kappa form is set solid by the presence of potassium ions. The reason for adding this gelling agent to the pantheon already available to modernist cooks is due to its ability to form well structured gels in the presence of animal proteins (either in meat, meat products or dairy). It is particularly useful as working as a thickening agent in ice cream. For the more traditional foodie you might like to know that before modernist gastronomy reared its ugly head, carrageenan was used in a traditional Irish recipe: boil seaweed in milk, remove seaweed, add sugar, allow to cool. The result is a sweet, milky jelly. I haven't tried it yet, but I can't help think it must taste a bit of the sea? Both types are included with the molecular gastronomy recipe book. More about Carrageenan. Sodium alginate would normally be paired with a calcium ion (usually calcium lactate) because when they combine they begin to set and form gel almost instantly. When used on its own sodium alginate forms a high viscosity liquid or even a paste. It is used in the food industry for example to create a red-pepper paste that can be squirted down the centre of cocktail olives. One thing worth noting is that sodium alginate will set even in low concentrations of calcium ions, so if you have hard water coming out of your taps then you'll find that sodium alginate starts to set as soon as you hydrate it. If your spherification recipes are going wrong, then in your taps is a good place to start looking for the cause of grief. More about Sodium Alginate. When using cream chargers for making foams then the addition of approx 0.2% xanthan gum can be quite an effective stabilizer, adding as much as 1% can give a very resistant foam with a nice tight formation holding in the nitrous oxide bubbles. More about Xanthan Gum. Lecithins are fats or oils. Soy lecithin is a lecithin that is derived from soy beans. As with many many of the molecular gastronomy chemicals used in the molecule-r cookbook, culinary useage is but one of the multitude of uses that soy lecithin can be put to. It's even in your printer ink! 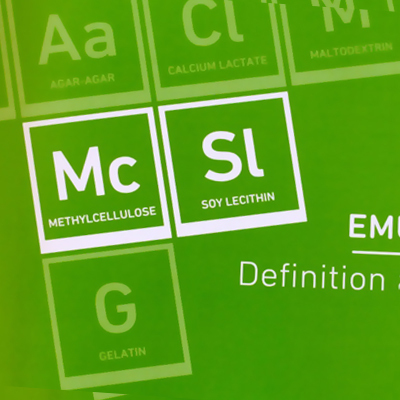 As a molecular gastronomy chemical its purpose is to help emulsify and stabilize other ingredients. The main property that makes it useful is its ability to attract hydrophilic (water loving) and lypophilic (fat loving) compounds, so it can bring them together in much the same way that soap can hold oils in water. In the production of sweets and ice cream then soy lecithin helps to prevent sugars from crystallizing as they solidify by keeping sugar molecules separated as they cool. Just like the soap I just compared it to, soy lecithin is a surfactant – meaning it likes to cause bubbles. 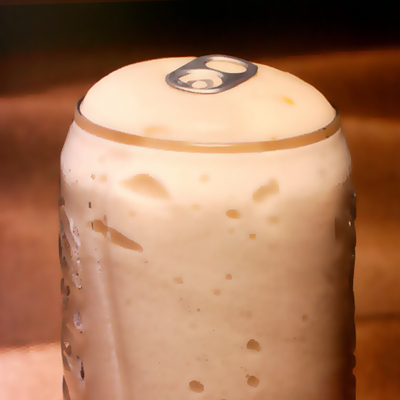 Indeed for many espuma recipes that call for the use of nitrous oxide chargers, it is possible to instead use soy lecithin and an immersion (hand) blender. So what is a surfactant and how does it make bubbles? Well to begin with – they don't make bubbles they just make it easier for a liquid to hold bubbles, they do this by weakening the attraction between liquid molecules (surface tension) and foming elastic layers. The result is deformable, bouncing bubble that don't collapse back in on themselves because the attraction between the molecules has been weakened. More about soy lecethin. All of the above is probably more than you need to know, but when you have purloined your own copy of the molecule-r gastronomy cookbook you'll want to know even more! 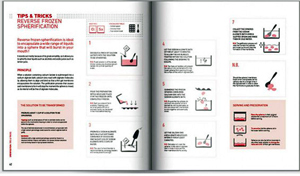 To find out more about the Molecular Gastronomy Recipe Book Deluxe Edition then visit the publishers website.